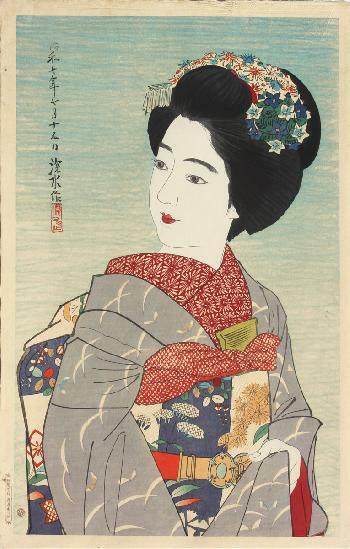 Maiko, from The Second Series of Modern Beauties. Paper size: 27.6 x 43.2 cm. Number 45 from an edition of 250 (see limitation seal verso, detail 2), published by Watanabe Shôzaburô in July 1932. “Sausage” seal plus 6mm. round Watanabe seal bottom left. Two drying holes in the left margin.